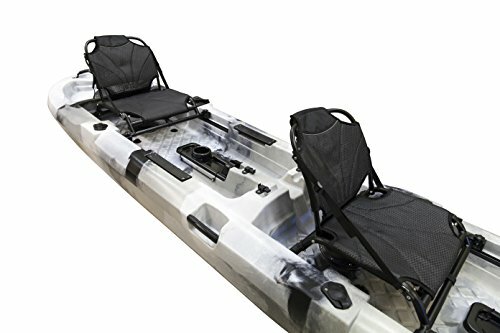 The BKC UH-PK14 is a tandem fishing kayak with twin pedal drive. Having twin pedal drive means you can cover large distances and move quickly across the water. It has a hand operated rudder control (controlled from the back seat) allowing response turns without using the paddles to steer. 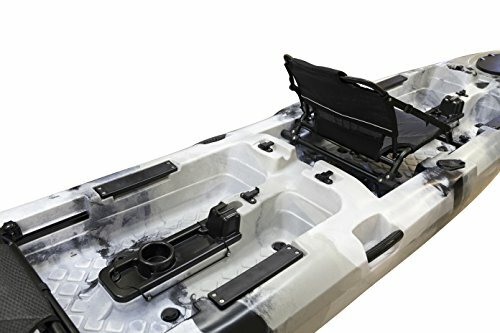 This Tandem Fishing Kayak with Pedals is designed for speed and has excellent stability. Even with just one paddler, it can be easily manoeuvred. Its watertight hatch is in the bow and is quite large. This kayak can carry enough gear for a multi day camp, or just a few hours out on the water.